Surrealism is my favourite ism! Surrealism is a cultural movement that began in the early 1920s, and is best known for the visual artworks and writings of the Surrealist group members. From the 1920s on, the movement spread around the globe, eventually affecting the visual arts, literature, film, and music of many countries and languages, as well as political thought and practice, philosophy and social theory. So it wasn’t simply about just painting at all. Salador Dalí and Rene Magritte, two of my all time favourite artists created the most widely recognised images of the movement. 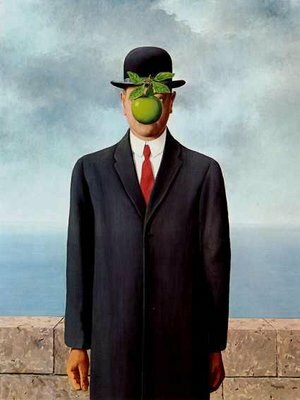 Show me an artist who hasn’t seen Dali’s Melting Clocks or Magritte’s apple man. Surrealism as a visual movement, had found its method: to expose psychological truth by stripping ordinary everyday objects of their normal significance, in order to create a compelling image that was beyond ordinary formal organisation, which in turn would evoke empathy from its viewers. 1931 was a year when several Surrealist painters produced works which marked turning points in their stylistic evolution: Magritte's Voice of Space is an example of this process, where three large spheres representing bells hang above a landscape. Another Surrealist landscape from this same year is Yves Tanguy’s Promontory Palace, with its molten forms and liquid shapes. Liquid shapes became the trademark of Dalí, particularly in his ‘The Persistence of Memory’ (The melting clocks. ), which features the image of watches that sag as if they are melting. Long after personal, political and professional tensions fragmented the Surrealist group, Magritte and Dalí continued to define a visual program in the arts. This program reached beyond painting, to encompass photography as well, as can be seen from this Man Ray self portrait. Today’s digital media and the ability to Photo just about anything see a whole new form of surrealism. Amazing artworks created in Photo and other such programs are only limited by the artist’s imagination and technical skill. Here is an example of digital surrealism. I find surrealism challenging both in its creation and concept. For me it is much more demanding of my skills to produce something that involves elements I can see before me and make things happen that I cannot see like floating items, things that aren’t there or such like. An example of my surrealist artwork can be seen here – Not a Still Life with Red Apples where it questions whether the bowl is permanently suspended due to the chrysalis suspended beneath and is the butterfly landing on the apple or carrying it? I like the appeal of painting real objects along with the surreal-ness by using elements that are not there and having to recreate them using my imagination.